2017 sees the British Road Race and Time Trial champs head into the Irish Sea to tackle the very famous roads of the Isle of Man with the road races taking on the classic IOM TT motorbike circuit (twice for the men) before a number of laps of a smaller circuit just outside of Douglas. The time trial tackles a lumpy circuit with a couple of stiff pulls and next to no flat road. Both the men’s and women’s road race course complete a full lap of the classic IOM TT course (2 laps for the men) including the 8.5km climb over the mountain (5% average but first 4.5km of the climb average 7.3%). 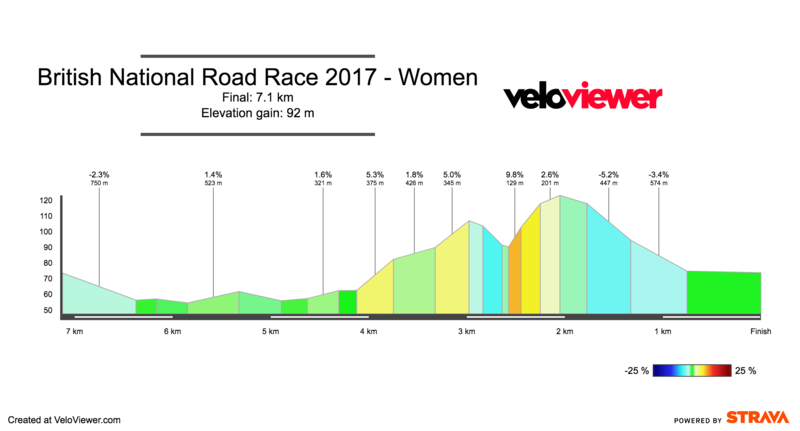 View full details of Women’s road race course. View full details of Men’s road race course. The final 7.2km loop is completed 6 times by the women and 10 times by the men and includes the narrow and undulating climb of Scollag Road before a wide descent to the finish straight at the IOM TT grandstand/pits area. A very lumpy time trial this year with a couple of sharp pulls and around 350m of climbing over a lap. The men complete two laps. View full details of Women’s time trial course. View full details of Men’s time trial course.